You're like a goldfish in a bowl, but still your love goes on and on. The international two girl/two boy quartet’s debut album Wonderlust is a crafted set of pop songs that bathe in the golden, restorative rays more commonly associated with life on the Californian coast rather than London, where Kid Wave reside. This is music that’s delivered with an uplifting sense of youthful wild abandon and imbued throughout with blissful surges of musical serotonin but with clear undercurrents of a wistful sense of melancholy too. Occasionally dark clouds obscure their sonic sunshine and there’s a nagging sense that no summer lasts forever. Nevertheless it’s an achievement made all the more remarkable by the fact that 22 year old singer/songwriter Lea Emmery and guitarist Mattias Blatt hail from the south-east coast of Sweden where sub-zero Baltic winds blow in to freeze the land for several months of the year, and that this debut was recorded in Stockport during the darker days and crepuscular nights of a dank English winter. Kid Wave craft slacker indie rock and transcendental dream-laden pop of a distinctly early 90s bent – music to lose yourself in and give your life to. We hear shades of Lush and Dinosaur Jr. in their sonic sunshine, though other ears might recall PJ Harvey, The Lemonheads, The Breeders, Pavement, Teenage Fanclub. But these are all bands largely operational before the members of Kid Wave were even born – artists who singer Lea readily admits she doesn’t always necessarily know much about - so let’s not get too entrenched in nostalgia for days gone by. The one thing that perhaps unites this music of the past with the Kid Wave’s effervescent present is an infatuation with melody; this quartet never sacrifice the song for volume or let the feedback do the work. Because at the centre, beneath the shoe-gazing dynamics and the dark lyrical undercurrents that speak of existential quandaries and the confusions of young life in the 21st century, is a big beating gorgeous pop heart. Wonderlust. It’s an aptly-titled for an international band whose founding members’ wanderings lead them to congregate in the capital. Kid Wave began life as a solo when Lea Emmery relocated from Norrköping (a city sometimes referred to as “Sweden’s Manchester”) to London in 2011 at the age of 18. She knew no-one, had no band, no contacts. But she did have drive, vision and ambition – insane levels of it, in fact. Several years playing classical piano at a local college in Sweden had lead to a stint in an all-girl punk band and though that tenure was short-lived, there was simply no turning back. Noise beckoned. What began life as solo demos soon morphed into Kid Wave when Mattias Bhatt, part of the same clique of indie kids back in Norrköping an now in London, signed up. From Perth, Australia, Serra Petale was teaching drums at a college where Lea was studying sound engineering and seemed “impossibly cool”. She was in. Bassist Harry Deacon was a friend-of-friends. A clutch of early songs were recorded with Rory Atwell (Palma Violets, The Vaccines, Male Bonding) production, before Lea sent some music to Heavenly Recordings – “and no-one else”. Kid Wave had no management, no team of people fighting their corner. Just songs. Heavenly liked what they heard and signed the band in early 2014. It was, Lea laughs, that simple. The plan that she had when she moved to London with some clothes and a guitar was working remarkably well. 2014 saw Kid Wave playing shows with The Wytches, TOY, The Orwells, Childhood and more recently with Jimi Goodwin at the Heavenly 25 weekend in Hebden Bridge. In autumn 2014 they recorded Wanderlust at the magical analogue wonderland that is Eve Studio in Stockport with producer Dan Austin (Doves, Cherry Ghost). Beyond the studio the lashing rain and dark north-west nights were banished by the youthful exuberance and sugared sounds being created within. Because Kid Wave sing escapist song of struggle, desire and yearning: songs born out of Lea’s lonely years as a teenager adrift in a foreign country, where the hope of musical success and a superhuman level of stubbornness were the only things stopping her from returning to the safety of the family home. There were, she says, anxieties. Plenty of those. Teenage dreams so hard to beat? Well – yes, actually. It’s a philosophy that still stands - that idea of music as a mood-altering, soul-saving outlet for bands and fans alike is alive and singing in the joyous rush of Kid Wave songs such as the breaking waves of sound on the jangling ‘All I Want’, the yearning ethereal pop of ‘Gloom’ or the chiming fuzzed-up pop riffs of ‘Wonderlust’. These are timeless songs that sing of life-defining moments, Wanderlust sure to soundtrack many a young romantic fumbling or infatuation, wild party or sun-rise revelation. 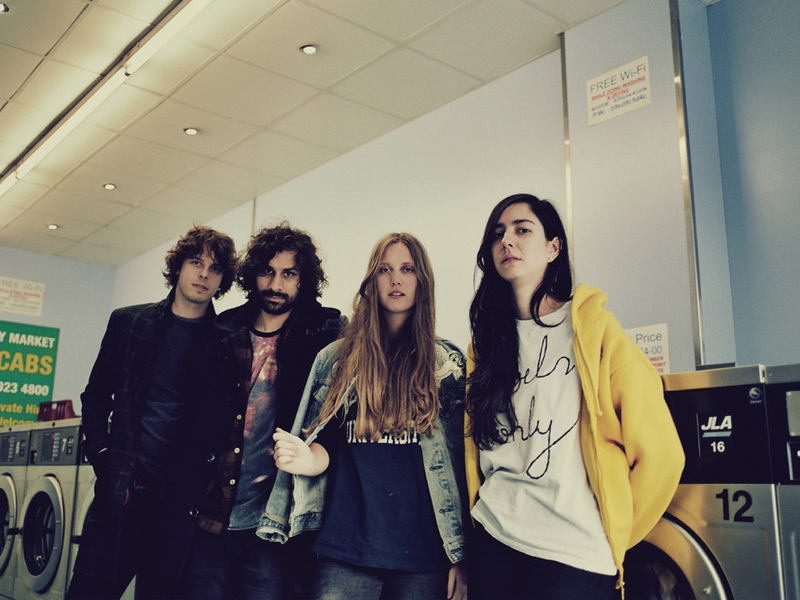 Kid Wave are the sound of liberation – of the very essence of life itself. ~Ben Myers. February 2015.